This week’s longer Design File is about the coffin and if anything, it shows that people are apprehensive even reading about the subject. Unlike other Design Files which garner a fairly robust bunch of ‘likes’ on their first day of publication on the Radio National website, this one has been remarkably slow on the uptake. Are we squeamish? Would we prefer the whole subject of coffins to be quietly dropped, please, thanks to our newly found hope for eternity? And yet we find cemeteries so interesting. Tours of Highgate Cemetery in London are always well attended. Old churchyards with leaning gravestones that tell you of ‘the laft years of mortality’ of country squires and simpler folk are vivid and romantic places. Last year I wandered for the first time among the crowded alleyways of the famous Pere Lachaise cemetery in Paris. So many names you recognise – Chopin, Wilde, Bizet, Piaf and so on (yes, yes, and Morrison). The elaborate styles, usually Classical as though this was the style decreed by Death itself. On a hill capturing views across the city so that you catch a sudden picturesque glimpse of the Eiffel Tower or the colourful top of the Pompidou Centre. Many cemeteries are in idyllic places, none more so than Sydney’s Waverley Cemetery which clings to the cliff between Bronte and Clovelly, stark and plain, one of the best bits of real estate in the city. Facing the sea that brought these people to Sydney, it has a grand and melancholy air that is entirely fitting. 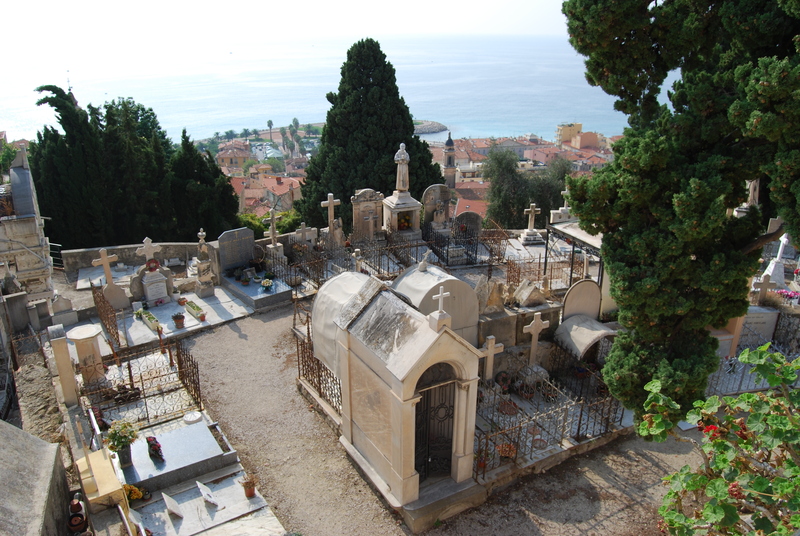 The cemetery at Menton is spectacular, crowning the hill above the town itself. Further along, in nearby Roquebrune, lies the simple square of Le Corbusier’s grave, shared with his wife Yvonne (black script on a colourful enamelled plaque tells you so). In both places the sea glitters below and behind you the rugged limestone mountains rise, and my mind tells me that the strongest feng shui is where land meets water. It seems so here (but do avert your eyes from the monstrosity of Monte Carlo to your right where strong feng shui seems to have only monetary value). Me for a sunny place, my grandfather is supposed to have told my mother (in his lyrical way). And sure enough, on the rainy day of his funeral in a rather isolated Argyllshire cemetery surrounded by dripping green trees, as we lowered his coffin into the ground, the sun came out, slanting over the freshly dug earth. It pleased my mother no end. Great piece Colin. There is a style about your writing that is identifiable you! I hear your voice when I read it. Wonderful and in a sense respectful and disrespectful at the same time! 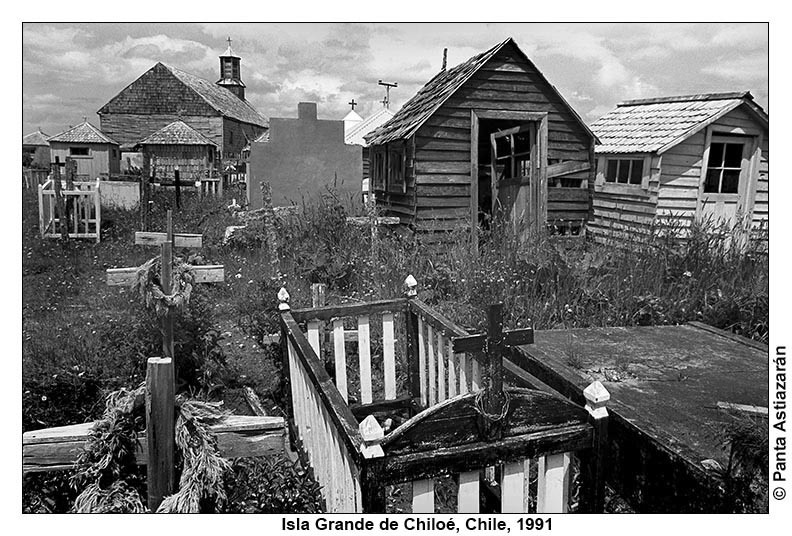 This is a typical cemetery in the southern island in Chiloé. They look sunny, even when it rains. And thanks for following/ commenting/ sharing! Wonderful photograph – so atmospheric. Interesting to see the structures all in wood – obviously no stone available? Are they all like this in Chile? And I wonder if they were painted brightly, or am I thinking of Valparaiso too much? You live in a fascinating country – definitely on my list of to-do’s.